Mount Royal University students will have to pay an additional $34.50 to receive coverage from the Students’ Association of Mount Royal University’s health and dental plan starting next year.Given the current funds being generated from benefit fees, the SA is expected to lose just under $25 per student in 2010-2011. A larger loss of $34 per student was projected for the 2011-2012 school year. The students’ association called a special general meeting on March 3 to address the projected deficits. Benefit fees have been raised one per cent yearly for the last decade, but the number of claims has simply outgrown the fee increases. Reserve funds are currently being used to mitigate the shortfall. Infographic by Bryan Weismiller. Costs have increased yearly since 2007.
four years rather than two that they may be more interested in finding out about the plan. He added that since the economic recession, more people are looking for ways to save money. “We were hoping that usage would go down a little — that it was an anomaly, but it looks like it’s a new trend,” Jones said. Students at the March 3 meeting were presented with three different options for covering the shortfall. One solution was to cut the maximum dental claim to $750, lower drug coverage to 70 per cent and reverse previous changes to paramedical allowances that cover things like physiotherapy. The fee increase was another option and a combination of both was also presented. 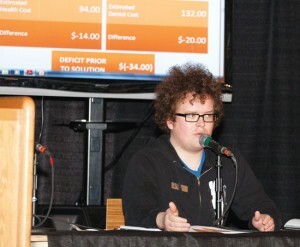 Students overwhelmingly voted in favour of passing the motion to increase fees. “Even though it is 18 per cent, we have to be realistic that things in life are costing more, so we can’t have the luxuries and enjoy things as they were before,” said student Missy Chareka who — by using the plan — saved $1,000 getting her wisdom teeth removed. Leszczynski said raising fees would likely increase the number of people who opt-out of the plan, which would cause further increases to cover the shortfall. When asked, Robert Jones didn’t rule out further increases next year. However, he said next year’s executive council would have to make that decision. What are the issues at stake for MRU’s Faculty?